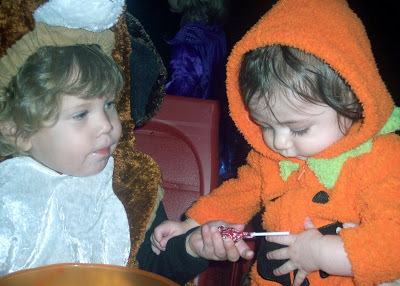 That seemed to be a better idea than taking Cate trick-or-treating, meaning I’d have to do the asking then Greg and I would have to eat all the candy. Trust me, there were lots of kids Cate’s age last night. Let me rephrase that: Lots of kids Cate’s age were used as props so their parents could trick-or-treat. I commend the sharing. I just didn’t realize that she took it and was chewing on the stick. Who cares about candy when there’s paper to be had. 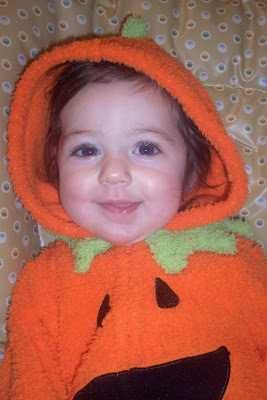 she is too cute in her costume and I totally know what you are talking about with the baby trick or treaters… ugg!! Come on people! 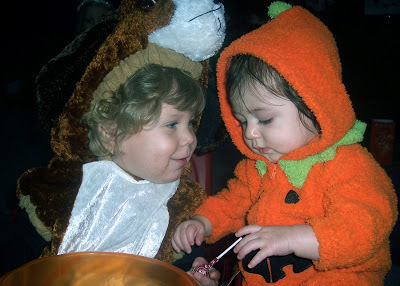 On that same note – a daycare mom who has a 11 month old is taking her around the neighborhood to T or T… I about died!